Welcome to the March Gifted Gorgeousness link-up. The link-up date will continue to be the 15th and I will keep the link-up open until the end of each month so you have plenty of time if you are late posting. 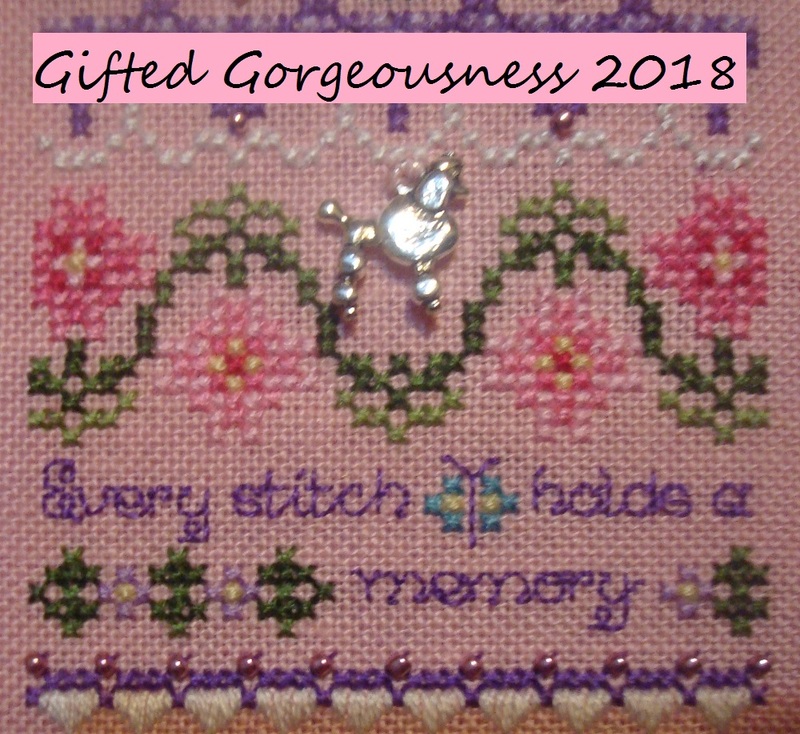 In the past month I have stitched a few gifted pieces and received a gift/prize myself. As well as the bag, there are some fabric pieces for smalls, some scrapbook embellishments and a wooden thread holder (I am starting a collection of these!). And a contribution to my pension fund. I mean, a delightful Lizzie*Kate chart, soon to be OOP! Love the sentiment on both those designs, just perfecr for this SAL. Maybe I will stitch it and make it the logo for next year? Now it is your turn to show us your Gifted Gorgeousness for the month. Please use your name or your blog name in the field and NOT the words "March Update" so I can easily see who has linked up this month. And link to the actual post, not just your blog. It is easier if you copy and paste the link, rather than typing freehand. Please could you remember to link up as well as make your post. The last two months there have been a few people making GG posts but not linking. Which means they don't get entered into the draw. If you have technical or memory issues, just leave a comment and let me know! Beautiful progress on your projects and fantastic win! I think that would be perfect for the logo next year. Jo: I love the goodie bag, lots of fun things there. Great progress, I am loving the fish Discworld Mappe. Nice progress! I loved the poppy card you were sent!AriadnefromGreece! Yes! Stitch the Lizzie Kate for next year. I love seeing your Discworld Map progress. Your chatelaine looks amazing, Jo! What a super goody bag! Great idea for next year's logo. You are stitching so many pretty designs it would be difficult to pick a favorite! What a great gift! Such lovely GG projects tat you can show here in this post. All of them show great progress and my favorite would be - as each time you show it - Diamond Bouquet. These JN band samplers are just gorgeous, and after seeing yours I prepared one for myself which I want to start this month. Lovely stitching, beautiful projects. I am becoming quite fond of the 12 Days of Christmas you are stitching this year. It might even make its way onto my stitching list for next year. I think you were a worthy winner of Heather's prize. Would you please count me in for the Easter blog hop. Beautiful stitching on so many gorgeous projects Jo. Love your giveaway win. Beautiful work on the Chatelaine! Also love that Discworld is coming out again. Great progress on Gardens of London, Jo. Goodmorning, Jo. I am in for the Easter Blog hop!!!!!!!!! I LOVE your chatelaine! Hugs, my friend. Great jobs here!Love all of them!Hugs! 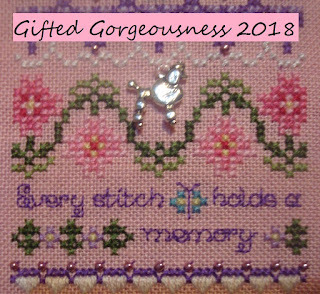 Lovely stitching and a great gift too. Wonderful work, Queen GG! Chatelaine's remain interesting to watch grow. 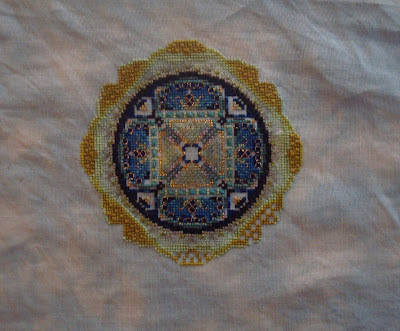 And the Discworld progress is always good! Your little gift set is nice and I bet wooden thread holders would make great wall art as a collection! My GG post will be late this month. We went on vacation and I am what I think you over-puddlers call "completely knackered". I'll get pictures soon. I hope. A great selection of stitching, Jo. Diamond Bouquet is one of my earliest Just Nan stitches and one of my few framed pieces. I am a little bit late - but I did manage to get my post up. Your Chatelaine is looking lovely! I feel so terribly late for everything this month! Your stitching is gorgeous as always. It's so fun to see your projects grow over the year! Lovely stitching; Gardens of London is looking just amazing! Love the bag from Heather, such a special gift she put together. Slithered in at the last moment here too, whew!